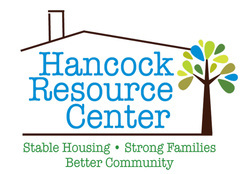 Hancock Resource Center served 1,333 families in 2013 with a total economic impact of $10,590,268 on the community. Over 11,480 hours of volunteer labor were coordinated through HRC in 2013, amounting to $154,176 in donated labor benefiting residents of Hancock County. · Hancock Resource Center provided construction management, volunteer coordination, and/or nonprofit funding to completely rebuild 12 homes and rehabilitate 17 homes in 2013, accomplished through partnerships with more than 10 other organizations, with a total economic impact of $2,470,035 for our county. · Foreclosure prevention counseling was provided for 391 families; 74 home foreclosures were prevented through this counseling. The value of the preserved homes is $7,943,400. · Through partnerships with Federal Home Loan Bank and The First, HRC provided home rehab and accessibility features for 23 low-income, elderly and/or disabled homeowners, with an economic impact of $115,811. · HRC provided Homebuyer’s Education, Post-Purchase, Money Smart, and Credit Repair classes/workshops to over 400 residents in Hancock County, affording them the opportunity to improve their financial standing. · Through the Mississippi Oil Spill Case Management Collaborative (MSOCC), HRC was able to assist 22 households totaling $17,240 in services. · The Transitional Housing Program for women affected by domestic violence assisted 14 families with relocation/rental assistance, employment training, and transportation and childcare assistance, allowing them to move toward self-sufficiency. This program totaled $49,646 in services to Hancock County women. · HRC assisted 8 families through the Emergency Food and Shelter Program by providing $4,656 in essential, emergency housing stabilization services. · One of HRC’s newest programs, Supportive Services for Veteran Families, allowed HRC to provide housing stabilization and supportive services to two Hancock County veterans and their families in the last quarter of 2013. · In partnership with Hope Haven, HRC provided coordination of The Salvation Army Angel Tree® and Toys for Tots® programs, serving 581 children in 426 families, with an economic impact of $46,480. · Thirty students graduated from the first high school class of the Hancock Youth Leadership Academy, a year-long program that promotes the development of character, courage, and service through civic commitment. · Seventeen Hancock County eighth graders graduated from the second junior high class of the Hancock Youth Leadership Academy in 2013. · HRC employs 10 people; 8 live in Hancock County. · HRC joins the South MS VITA/EITC Coalition as the newest Volunteer Income Tax Assistance site, offering free tax preparation to low-income families in the area.